nice work. The stem looks great. Looking great. And your labors on the stem are really amazing. Looking forward to seeing the finished product! Awesome work! I'll stay tuned for final update. I switched to an electric iron for steaming dents. It's far more effective than a heated knife, etc and way more convenient. I picked up one just for pipe work at a yard sale this summer. Could not believe my eyes, You sure got some skills. and nerves of course. The only what I can do is sanding and polishing tooth chatter off the stems,yet remove some buildups oxidations, that's about it. Well it's been a crazy busy past few weeks. We got hammered with the worst wind storm in recent history here im the gulf islands of BC. 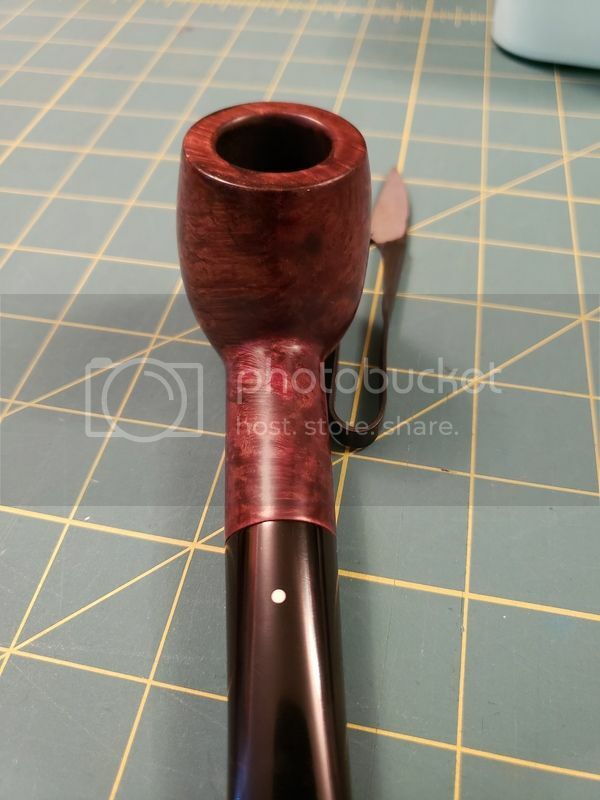 Well last night I spent some time finishing up the dunhill. The stummel was full of dents. I don't know what happened to this pipe in its previous life but it sure wasn't cared for at least on the outside. I steamed out many of the dents but ended up having to fill some with ca glue and blend them in. I sanded the exterior with micro mesh pads leaving the somewhat faint markings intact. 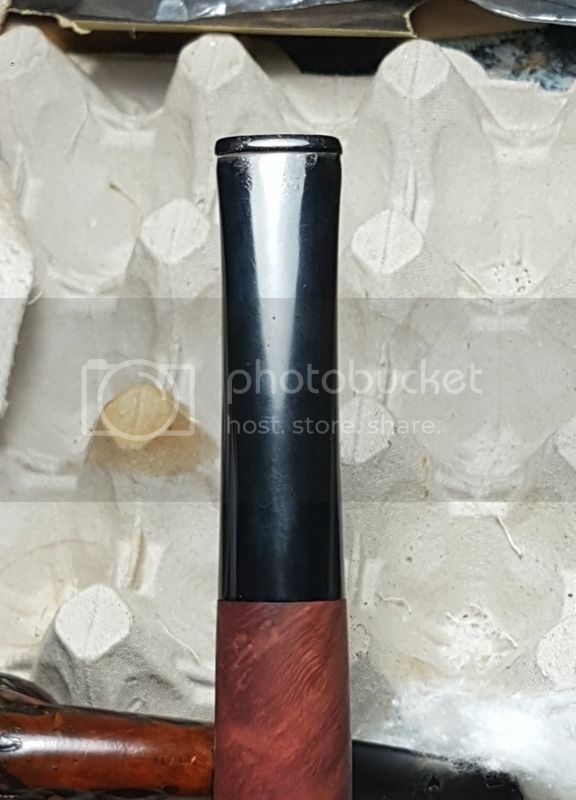 Using brown Tripoli and white diamond to polish it I then used a combination of stain pens and leather dye to restore the color and a coating of wax to finish. Other than a few small cosmetic issues im quite happy with the final results. Strong work! You have skills my friend. Nicely done. What did you use to rebuild the button? WOW!. That's all Just WOW! Beautiful work. The button work is amazing. Outstanding job. Well done indeed. That stem restore is fantastic! 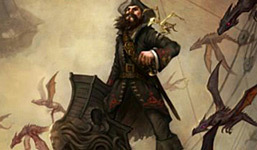 Thanks so very much you guys! I'm excited to see the feedback since I'm very new to restoring pipes. The button restoration started with the oxiclean bath and detailed interior cleaning. Then I moulded some playdough into the airway and moulded what I thought the inside of the bit should look like. I've tried card stock with a release agent on it before but was not completely happy with the results. Then i mixed medium CA glue with active charcoal and built it up in thin layers hitting it with activator between coats. Then once sufficient build up was there i used a flat file too shape the stem and button. A thin layer of plain ca filled any small imperfections. I Then filed and sanded with micro mesh, polishing compound and wax to finish. The benefit of the play dough is it seals the airway and even with the glue on it, it can pick picked and pushed out. A quick clean up with a hobby knife and micro file and it seems to be good as new. 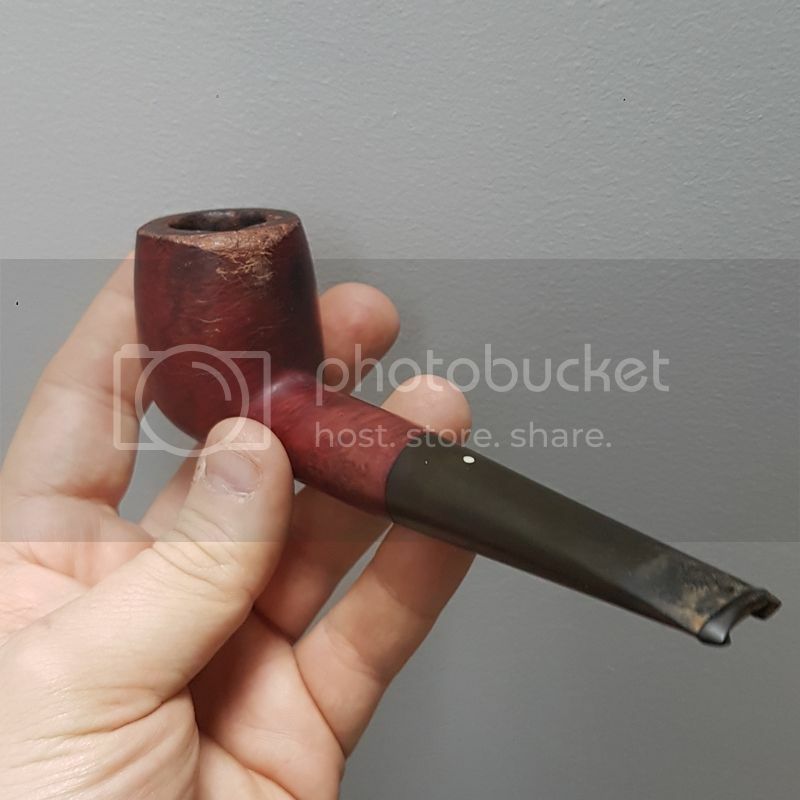 I'm most critical of my own work and can see areas to improve but I'm very happy with this 75.00cdn dunhill. The size and weight is unlike any others I have and can't wait to smoke it. Impressive work! What a rescue! Nice idea to mould the button area with removeable Play Dough, then re-build it with CA and charcoal. Thanks for the play-dough airway fill tip, I'll have to give that a try. Superb. 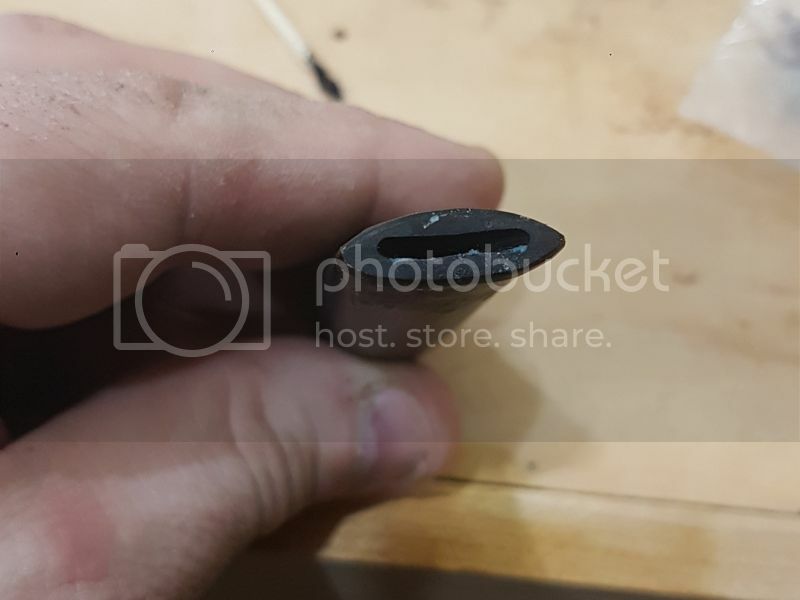 What did you use to build up the rim? He sure beat the heck out of it- probably knocking out dottle on an ashtray or cement. That's really impressive. It's reborn. 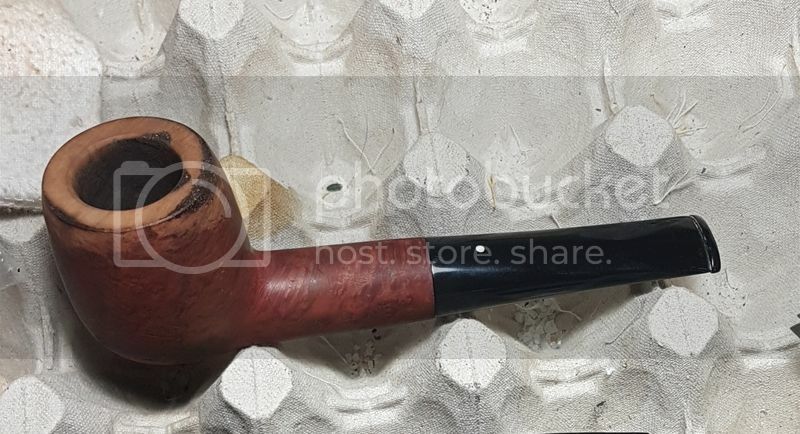 Your restoration revealed a lovely pipe! Where did you get the briar dust? Is that from an old pipe that you're grinding down for dust? You have a fine touch for restoration work. 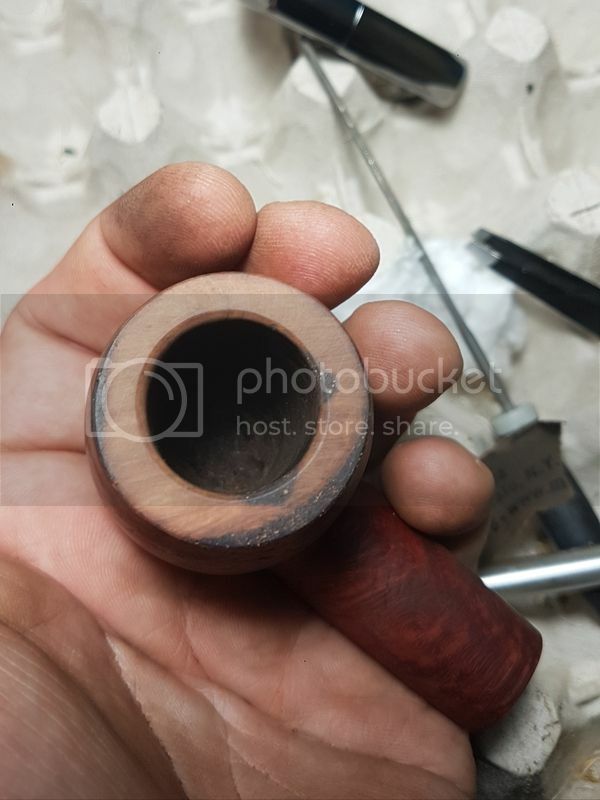 correct, every time ive topped a pipe i keep the briar dust for just this project. 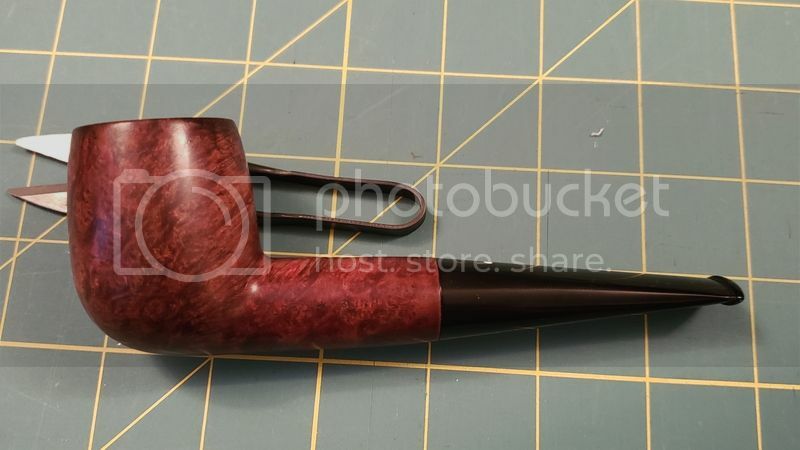 i also have a old busted briar pipe that i sand to collect more if i run short. 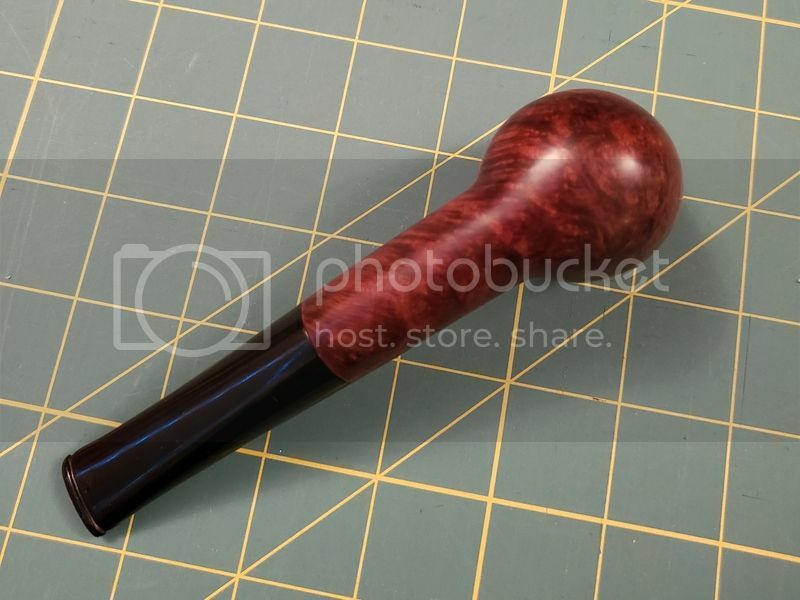 i should just buy a block of briar for the sake of having it on hand.